“The best street show I have ever seen.” Steven Berkoff. Actor, director & playwright. UK. Joseph D’Amour Bouffon (Joseph, the fool of love) wanders the world weeping, singing for his lost love. He starts a show in her memory. A crowd forms. A beautiful woman is smiling at him! A new love? Excitement builds as D’Amour pulls every trick he can, trying to impress. Audiences the world over have enjoyed his foolish attempts to win a single kiss. Will he get the girl? Will he be worthy of a kiss? Will he prove himself a modern man!? A classic tale of man’s struggle to impress. With a stupendous French accent. Perfect for festivals, open air performance, cabaret, theatre, as an MC, and for schools/colleges. Joe May unpicks the tricky job of being a modern man. 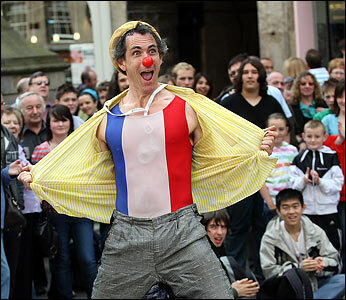 This is a clown with a few points to make – flexibility, sense of humour, fitness, fame, a feminine side and the ability to multitask…all shown through surprising circus tricks, contortion and humour. The theme makes this show highly accessible for school students of various ages.